Almond Joy. A devotional by Barri Cae. Messianic. The word of the LORD came to me saying, "What do you see, Jeremiah?" Many of us can remember the candy bar jingle, “Sometimes you feel like a nut; sometimes you don’t.” The jingle of the Almond Joy candy bar was brought forth in 1977. The author earned $10 and the candy bar company enjoyed massive success, even today in the 21st century. According to various sources, the almond originated in the Middle East. It was known as one of the best products. According to Numbers 17, Aaron’s rod, made out of the almond tree, sprouted, thus denoting that he was God’s choice to be priest: Now on the next day Moses went into the tent of the testimony; and behold, the rod of Aaron for the house of Levi had sprouted and put forth buds and produced blossoms, and it bore ripe almonds. It was a miracle that the rod blossomed. God’s choice was for Aaron to be priest. The Hebrew word for almond is שָׁקַדַ shah-kahd. The Hebrew language is so beautiful. It is known as the Lashon Kodesh, the Holy tongue. The language is so holy that one cannot curse in Hebrew. Curse words are in English or Arabic. In Jeremiah 1:11, the LORD asks Jeremiah a question, What do you see? Jeremiah answers, I see a rod of an almond tree. The almond is the first tree that awakens in the early spring. 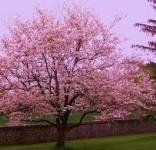 The almond is the early bird of trees, also known as the hasty tree. Even though Jeremiah was looking at a rod, a tool for chastening, the rod was the almond tree, the ‘hasty tree’. The LORD then does a play on words. His reply back to Jeremiah was: Then the LORD said to me, "You have seen well, for I am watching (שֹׁקֵד. shoh-kayd) over My word to perform it." God had given Jeremiah a holy assignment; to prophecy against Israel, to condemn their heathen wickedness. God gave Jeremiah a very tough assignment. In addition to this holy assignment, God had Jeremiah remain unmarried, a difficult calling. Yet, with the challenge came the promise, I am watching over My word to perform it. 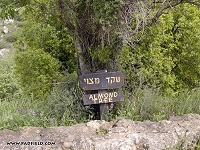 The LORD provided a play on the Hebrew word, almond (שָׁקַדַ. shah-kahd) and watching (שֹׁקֵד .shoh-kayd) - the hasty tree and the watching, the assignment, the promise and the blessing. Many of us are in the same place as Jeremiah. A holy assignment has been given. This holy assignment includes affliction. It is not an easy place; it is a lonely place; God calls His children aside at times, to endure affliction. It is not punishment, but to serve holy purpose for God’s perfect divine will. Only when we reach the other side, in heaven, will we truly understand God’s purposes for suffering. Perhaps the LORD has put a holy assignment upon you. You have found yourself in a challenging place, a place in which you have never been before. Grab hold to the tree; to the Cross, for there is power in the embracing of the Cross. Through your affliction, know that the LORD is watching (שֹׁקֵד. shoh-kayd); He sees. Look upon my affliction and rescue me, for I do not forget Your law.